Apple pie. What's more American than apple pie? I've been making a lot of apple pies the last few months since autumn apples are in season. I went to middle school and high school in Rochester, NY and have always loved going apple picking (and picking various other types of fresh fruit) at a local family owned fruit farm called Hurd Orchards, in Holley New York. I went back to Hurd Orchards (which also makes the best jellies and apple butters ever) with my mom and husband over Rosh Hashanah (the Jewish New Year) in September when I was home visiting my family for the holiday so we could pick apples to go with the honey for a sweet new year, and have fresh New York State Apples for apple pie. (We picked two varieties - Macintosh and a Cornell-pesticide free variety). Over the past year, I've studied many apple pie recipes (Brad's grandmother's, Martha Stewart and President Obama's baker, Bill Yosses [known by the President simply and affectionately as "the crustmaker."). Based on these recipes, and some trial and error, I think I have developed the perfect apple pie. The first step, when thinking about apple pie is determining what kinds of apples to use in the pie. I believe that you should use the same types of apples, but there's quite a few varieties that will taste good. Personally, my favorite varieties to use in an apple pie are either Honeycrisp, Gala or Macintosh, but other varieties such as Empire, Cortland or Macoun will work just fine as well. Obviously apple pie is the best when you can get fresh farmer's market apples. Other than that trip to western NY, I am fortunate to have a great Sunday farmer's market across the street in Brooklyn that has provided with great local apples. The first step in making a killer apple pie is making a killer crust. I have experimented with making crusts with butter and canola oil. Personally, I prefer an apple pie crust made with butter, even though obviously canola oil would be healthier. Bill Yosses, renowned New York City pastry chef, who is presently Obama's personal White House Pastry chef makes his crust out of a combination of butter and lard (which I believe is pig fat). I have not tried that, however, because I do not cook with pig products. However, upon doing a bit of research, lard is typically added by some pastry chefs to increase the degree of flakiness in the texture of the pastry. It is absolutely imperative to make the crust in an artisan stand mixer, so if you don't have one yet, now is the time to get one in the color of your choice (mine is mint green). You cannot make a good pie crust without one. One further note with respect to sugar: Yosses uses 1/4 cup sugar; Martha Stewart uses none. I prefer just a tad of sugar, so I split the difference. However, if you don't want the sugar, you can leave it out and it still tastes great. 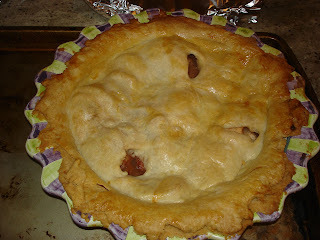 Here is my recipe for the perfect apple pie crust (which is great for blueberry and cherry pies as well). Put the above ingredients in the mixer and add the cold water slowly while the mixer is running. Mix until forms an even dough, no more than 30 seconds. Separate the dough for two balls (one for the crust and one for the top) and refrigerate for 1 hour. Next, roll out one of the balls on a floured surface to make fit a 9 inch pie pan and mold to fit the bottom and sides of the pie pan. Before doing this, you should grease the pie pan with PAM. Yosses actually cooks the fruit at this point. I do not. I prefer to let the mixture cook in the oven. So, if you are following my recipe, mix the filling well and add to the pie crust, raw, without doing anything funky with it on your stove top. The roll out the top and make the circular cover for the apple pie. Pinch the edges with your fingers, or crimp with a crimper if you have one (I don't have one yet). The bake 20 minutes at 400 and reduce heat to 350 and bake for 40-50 minutes more. An alternate variation, which I am going to try this weekend based on the Yosses recipe is to cook the bottom of the pie separately at 400 for 20 minutes (until it begins to turn golden) WITHOUT the filling. Then add the filling and the top and the glaze and cook at 350 for 40-50 minutes until done. This should increase the flakiness/crispness of the pie crust. And this is my signature apple pie. You have a farmer's market across the street from your condo? I'm terribly envious.... Is it year-round?